The geeks have whined, bitched, and moaned. Now they get to see the fruits of their labor. EA and Bioware are releasing free DLC that will expand (read: not change) the ending to the epic that is Mass Effect 3. The DLC will add extra cinematic scenes as an epilogue to the game. BioWare believes that this will strike a nice balance between between answering the fans questions and maintaining the artistic vision of Casey Hudson and his team. Look forward to downloading the DLC on all three platforms (PC, 360, and PS3) some time this summer. And while they have it marked as expiring on 04/12/2014 they do plan on keeping it free and availble as long as they can, but they add expiration dates to all free content. REDWOOD CITY, Calif. --(BUSINESS WIRE)-- BioWare , a Label of Electronic Arts Inc. announced Mass Effect™ 3: Extended Cut, a downloadable content pack that will expand upon the events at the end of the critically acclaimed Action RPG. Through additional cinematic sequences and epilogue scenes, the Mass Effect 3: Extended Cut will give fans seeking further clarity to the ending of Mass Effect 3 deeper insights into how their personal journey concludes. Coming this summer, the Mass Effect 3: Extended Cut will be available for download on the Xbox 360® videogame and entertainment system, PlayStation®3 computer entertainment system and PC for no extra charge*. "We are all incredibly proud of Mass Effect 3 and the work done by Casey Hudson and team," said Dr. Ray Muzyka, Co-Founder of BioWare and General Manager of EA's BioWare Label. "Since launch, we have had time to listen to the feedback from our most passionate fans and we are responding. With the Mass Effect 3: Extended Cut we think we have struck a good balance in delivering the answers players are looking for while maintaining the team's artistic vision for the end of this story arc in the Mass Effect universe." Casey Hudson, Executive Producer of the Mass Effect series added, "We have reprioritized our post-launch development efforts to provide the fans who want more closure with even more context and clarity to the ending of the game, in a way that will feel more personalized for each player." The Mass Effect franchise is one of the most highly decorated series in the history of games, having earned over 250 awards from critics around the world. 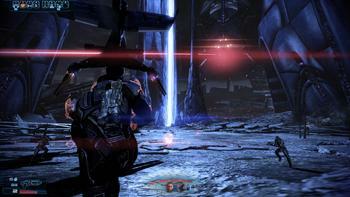 Mass Effect 3 launched last month to universal critical acclaim, receiving over 75 perfect scores. For more information on Mass Effect 3, please visit http://masseffect.com, follow the game on Twitter at http://twitter.com/masseffect or "like" the game on Facebook at http://facebook.com/masseffect. Press assets for Mass Effect 3 are available at www.info.ea.com. * OFFER EXPIRES APRIL 12, 2014. INTERNET CONNECTION AND ORIGIN (EA), XBOX LIVE, OR PLAYSTATION NETWORK ACCOUNT REQUIRED. VALID ONLY AT THE ORIGIN CLIENT SOFTWARE (WWW.ORIGIN.COM/ABOUT), XBOX LIVE MARKETPLACE OR PLAYSTATION STORE. VALID WHEREVER MASS EFFECT 3 IS SOLD. MASS EFFECT 3 FULL GAME AND ORIGIN ACCOUNT (EA) REQUIRED TO USE/PLAY DOWNLOAD. OFFER MAY NOT BE SUBSTITUTED, EXCHANGED, SOLD OR REDEEMED FOR CASH OR OTHER GOODS OR SERVICES. MAY NOT BE COMBINED WITH ANY OTHER OFFER, GIFT CARD, REBATE OR DISCOUNT COUPON. PRODUCT SUBJECT TO AVAILABILITY. VOID WHERE PROHIBITED, TAXED OR RESTRICTED BY LAW. LIMIT ONE OFFER PER PERSON. YOU MUST MEET THE MINIMUM AGE REQUIREMENTS, WHICH VARY BY COUNTRY, TO REGISTER FOR AN ORIGIN ACCOUNT (EA). EA MAY RETIRE ONLINE FEATURES AFTER 30 DAYS NOTICE POSTED ON WWW.EA.COM/2/SERVICE-UPDATES. The BioWare Label is a division of EA which crafts high quality multiplatform role-playing, MMO and strategy games, focused on emotionally engaging, rich stories with unforgettable characters and vast worlds to discover. Since 1995,BioWare has created some of the world's most critically acclaimed titles and franchises, including Baldur's Gate™, Neverwinter Nights™, Star Wars®: Knights of the Old Republic™, Jade Empire™, Mass Effect™ and Dragon Age™.BioWare currently operates in eight locations across the world, including Edmonton (Alberta, Canada), Montreal (Quebec, Canada), Austin (Texas), Fairfax (Virginia), San Francisco (California), Los Angeles (California), Sacramento(California) and Galway (Ireland). In 2008, BioWare was acquired by Electronic Arts, a leading global interactive entertainment publisher. In 2011 EA created the BioWare Label, alongside EA Games, EA SPORTS™ and EA Play. For more information on BioWare, visitwww.bioware.com, or follow us on Twitter at www.twitter.com/biofeed. To join the millions of fans already registered with the BioWare community, go to http://social.bioware.com. BioWare, Mass Effect, Jade Empire, and Dragon Age are trademarks of EA International (Studio and Publishing) Ltd. EA SPORTS, The Sims and Need for Speed are trademarks of Electronic Arts Inc. John Madden, NFL and FIFA are the property of their respective owners and used with permission. "PlayStation" is a registered trademark of Sony Computer Entertainment Inc. Xbox and Xbox 360 are trademarks of the Microsoft group of companies and are used under license from Microsoft. All other trademarks are the property of their respective owners.